International education, service-learning, and community-based global learning programs are robust with potential. They can positively impact communities, grow civil society networks, and have transformative effects for students who become more globally aware and more engaged in global civil society – at home and abroad. Yet such programs are also packed with peril. Clear evidence indicates that poor forms of such programming have negative impacts on vulnerable persons, including medical patients and children, while cementing stereotypes and reinforcing patterns of privilege and exclusion. These dangers can be mitigated, however, through collaborative planning, design, and evaluation that advances mutually beneficial community partnerships, critically reflective practice, thoughtful facilitation, and creative use of resources. Drawing on research and insights from several academic disciplines and community partner perspectives, along with the authors’ decades of applied, community-based development and education experience, they present a model of community-based global learning that clearly espouses an equitable balance between learning methodology and a community development philosophy. Emphasizing the key drivers of community-driven learning and service, cultural humility and exchange, seeking global citizenship, continuous and diverse forms of critically reflective practice, and ongoing attention to power and privilege, this book constitutes a guide to course or program design that takes into account the unpredictable and dynamic character of domestic and international community-based global learning experiences, the varying characteristics of destination communities, and a framework through which to integrate any discipline or collaborative project. Readers will appreciate the numerous toolboxes and reflective exercises to help them think through the creation of independent programming or courses that support targeted learning and community-driven development. The book ultimately moves beyond course and program design to explore how to integrate these objectives and values in the wider curriculum and throughout formal and informal community-based learning partnerships. "Global learning is full of paradox, straddling intention and ambiguity. It is more important than ever to encourage the basic human impulse to connect with people across boundaries. Yet we also have a responsibility to introduce young people to a harsh reality - that 'making a difference' is actually quite difficult. Hartman et al's book is a beacon and a guide for how we can support all who are beginning the lifelong journey of understanding how social transformation happens." "This is an important book on Community-Based Global Learning. The authors, all leading thinkers and practitioners in the field, have written a unique volume that sits at the intersection of theory and practice and thus will be of immense value to both practitioners and scholars. Perhaps most importantly, this volume uses an informed critical lens and does so in a way that will not paralyze practitioners who seek to do this work but will instead free us to do it better." "The authors invite readers to re-imagine global service learning through a lens of community-based global learning and they do this by putting criticality at the center. 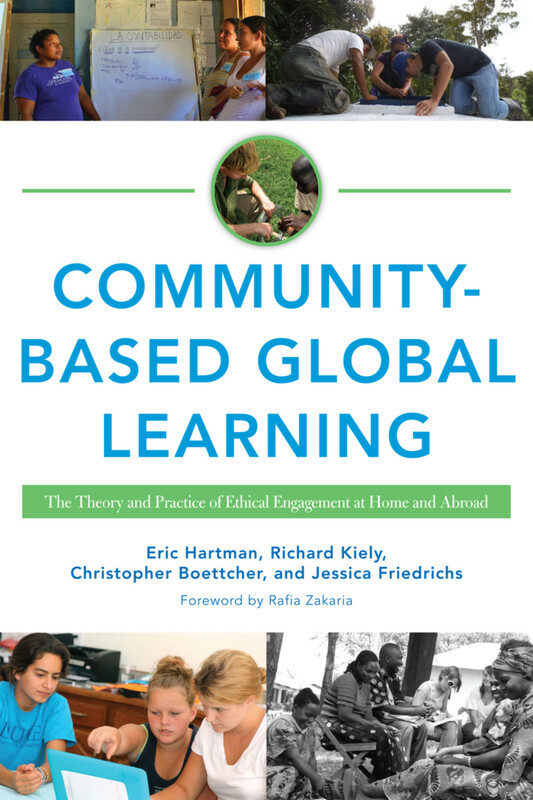 This book creates a space for the tension that CBGL educators and practitioners confront and experience when engaging in global community-based learning programs. It offers strong theoretical insights and practical tools to go deeper with our students and ourselves, especially as it relates to reflective practices and intentional program design. It’s a strong resource for doing CBGL with critically reflective intentionality." "As a (global) service learning scholar-practitioner located in the Global South, I am deeply gratified to read a book that is reflexive and aware of the inherent power dynamics in the practice of CBGL, and in the understanding of global citizenship as a commitment to fundamental human dignity. There are many strengths to this publication. Most noteworthy for me is the idea that if it is impossible to be a development agency without a theory that directs action to the underlying causes of underdevelopment. If universities are partnering with development agencies in CBGL, then aren’t they taking on the role of a development agency, thus needing a theory of development as institutions? This is a profoundly new way of thinking about the university and its role in its broader socio-political context. In this way, the book makes visible, many invisible processes, inequities and positionalities – all of which without critical, thoughtful reflection, can contribute to reinforcing Global North-South divides. The text – which is both practical and theoretical (an achievement in itself) – should be required reading for anyone interested in the practice of CBGL and the role of universities in international education, global citizenship and social justice." "Grounded in development theory and Fair-Trade Learning principles, this book provides actionable strategies and tools for building meaningful community-based global-learning programs in a variety of forms and within a variety of institutional frameworks. More importantly, however, the authors challenge us to think critically about our motivations for designing programs and push us towards a broader interrogation of higher education’s role in championing peace and social justice and educating for social change. Bringing the same cultural humility we look to develop in our students, the authors encourage us to join them in co-creating a community of practice that advances the democratization of knowledge." "While we continue to debate the relative merits of two physically 'distanced' and generic models of education—one that is safely sequestered within walled-and-gated campus compounds, and another that asks students to stare at flickering pixels for hours on end—Hartman and friends reveal a deep and transformative ‘third way’—one that invites a new generation of students and educators to learn in and with and for global communities. May their tribe increase." "Writing with deep knowledge, experience, passion and conviction Hartman and associates provide an essential resource for study abroad faculty, community engagement staff or anyone wishing to engage in effective, ethical, cross-cultural service and learning. Their arguments and program examples, theoretically contextualized and practice-focused, advance frameworks for integrating any discipline with global learning and achieving learning and assessment outcomes desired by universities. They attend to challenges of power, privilege and positionality, which flow throughout this work, as well as safety and risk management. This book will become a classic in the field." "Many colleges and universities claim to graduate 'global citizens' from their programs, but studies reveal that few accomplish this lofty goal. Grounded in decades of research Community-Based Global Learning unpacks terms like 'global citizen' and 'transformative learning' and presents an alternate vision of 'critical global citizenship' made accessible through a concrete toolbox of activities. This practical hands-on approach will help Higher Ed. professionals to conceptualize and develop equitable partnerships and successful global learning endeavors. CBGL is an an essential handbook for creating and sustaining community-based projects at home and abroad and will benefit both seasoned and new practitioners alike." "This book provides a useful definition of community-based global learning and ample evidence of its positive uses throughout the world. Through multiple examples, Hartman, Kiely, Boettcher, and Friedrichs prove that community-based global learning must be grounded in mutual respect for the learner. What’s more, in their careful and meticulous descriptions of people involved in ethical engagement activities at home and abroad, the authors display the utmost respect for the learning process itself." "A thoughtful, well-informed analysis of the promises and pitfalls of engaging in ethically-sound community-based global learning. With examples and insights, they examine the core topics of good engaged pedagogy: learning objectives like global citizenship, reflection, intercultural communication, partnerships, and practical issues of implementing community-based global learning courses. Simultaneously applied, theoretical, moralistic, critical, and visionary, this book is a must read for all practitioners of not only community-based global learning but also all practitioners of community-based experiential learning." “The authors, all of whom have extensive experience in administering and running study-abroad and community engagement programs, lay out, piece by careful piece, how an ethical basis of engagement between two markedly different populations can be made fruitful and positive for both. "Community-Based Global Learning combines rich theoretical analyses and conceptual material with scenarios, practical examples, and toolboxes. Throughout the book, the authors advance the scholarship in critical development studies and global citizenship education in a profound, yet accessible, way. The result is a highly effective facilitator’s guide for developing students’ global competency skills, critical reflection, cutting-edge learning experiences, and life-long reflection; while simultaneously challenging us to reimagine the role and impact of institutions of higher education." Community-Based Global Learning raises the bar on what it means to offer quality and responsible off-campus, community and partnership-based programming in higher education. The authors achieve an impressive balance between a review of foundational theoretical work and the sharing of instructive cases and numerous examples of approaches and resources that can readily be adapted and applied across diverse community and organizational settings." 6) Immersive Community-Based Global Learning Program Design: What Are Your Team's Goals? Eric Hartman is Executive Director of the Center for Peace and Global Citizenship at Haverford College and co-founder of globalsl, a network dedicated to ethical, community-based global learning. Richard C. Kiely is a Senior Fellow in the Office of Engagement Initiatives at Cornell University and co-founder of the globalsl network. Christopher Boettcher is an Associate Professor of English at Castleton University. Jessica Friedrichs is an Assistant Professor in Social Work and the Coordinator of the Just and Merciful World Curriculum at Carlow University in Pittsburgh, PA.